I'm so happy to be a part of the Happy Little Stampers Design Team. And I'm excited to be sharing some cards I've made with the fantastic first release. Comment on the HLS Blog and then continue on to each Designer. You must comment on all the blogs in the hop to be eligible for prizes. You should have come to me from Kylie's blog. If you've missed something, just go to the HLS Blog to start and you'll find your way. The blog hop will run for one week giving you enough time to hop through and check out what the designers have created. One lucky commenter (selected randomly) will win the whole release! That's four sets of stamps with a value of AUD$69. 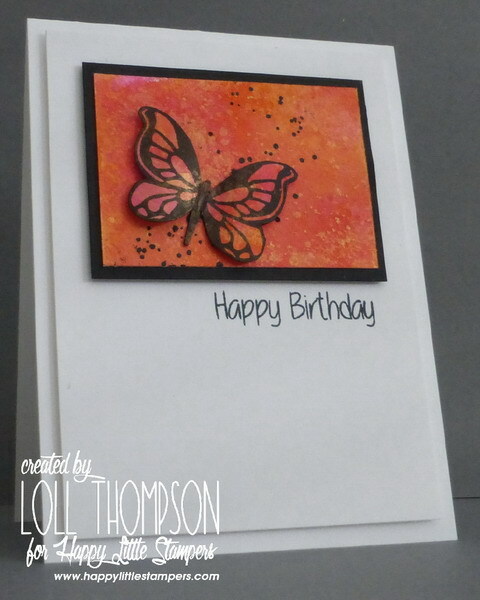 My cards using Butterfly Birthday stamp set. 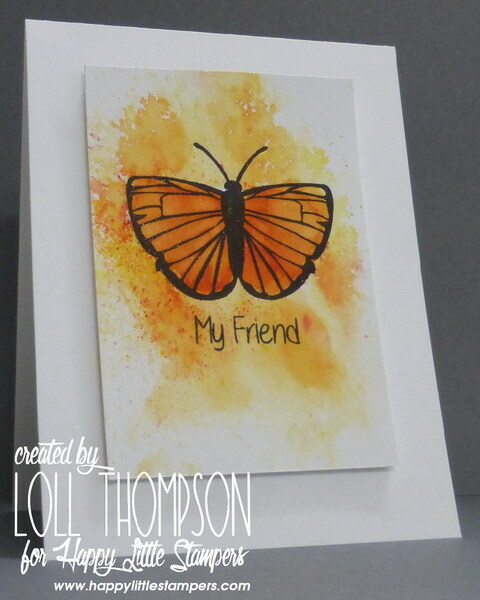 For the card above, I used brushos on mixed media paper, stamped the butterfly, and then picked up more brushos with a brush to darken the butterfly wings. For the card above, I used the paper from SU! that comes already embossed with a leaf design (how easy is that!). 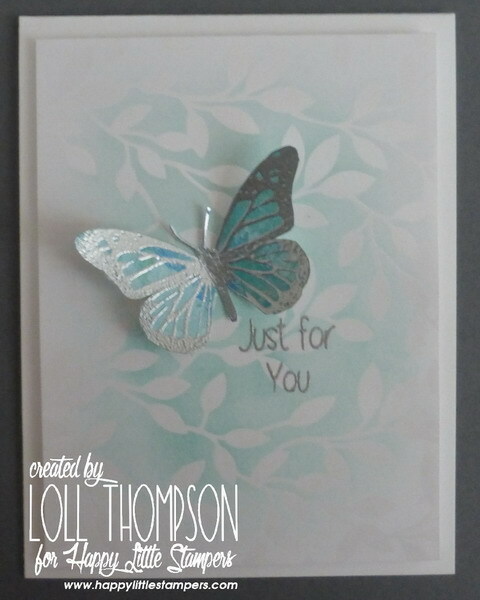 :) I simply sponged a little over the center and popped up my liquid platinum embossed and fussy-cut butterfly which I had coloured with two shades of blue ink. For the card above, I sprayed my watercoloured paper background with yellow, orange and pink. Once dry, I flicked on some diluted Inka Gold and stamped the dots in the background in black. The butterfly was cut from the same watercoloured paper, stamped in black and fussy-cut. Next up are my cards using Mixed Christmas Sentiments stamp set. For the card above, I die-cut the candles twice, once in gold foil paper and once in gold glimmer paper and inlaid the pieces. The sentiment is stamped in versamark and heat embossed in gold. Love the elegant script of this HLS sentiment! 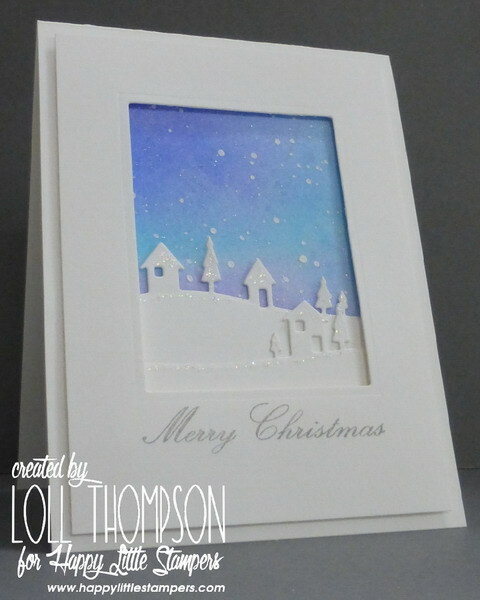 For this card, I used brushos for the background and added glitter for sparkle to the snowy hills and houses. I framed the card and added this beautiful HLS sentiment in soft gray. And here are my cards using the Bold Birthday Sentiments stamp set. 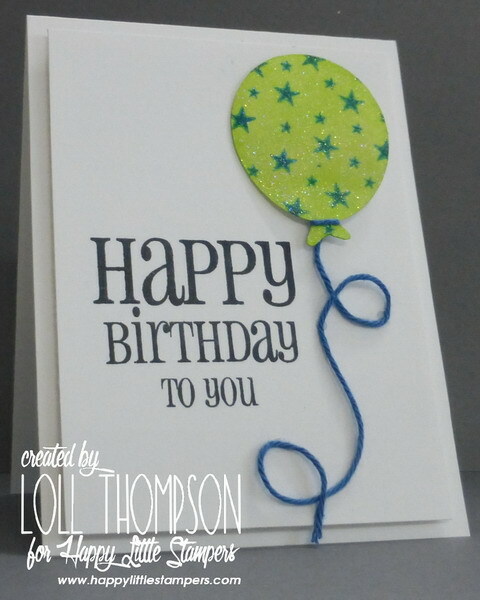 For this card, I used my cameo to cut out the balloon, sponged with twisted citron ink and stamped blue stars. I coated the balloon in Versamark and heat embossed with iridescent ice powder. So fun pairing the balloon with the fun font of the HLS birthday sentiments. For this card I used stencil monoprint technique with brown and blue watercolour sprays for the background. I combined a few of the different sentiments from the HLS birthday sentiments to come up with a sentiment that fit the design. These sentiments are so versatile! For this card I used two shades of green watercolour sprays for the background and once dry, placed a geometric stencil over top and sprayed with water, blotted to remove the excess and leave a design. 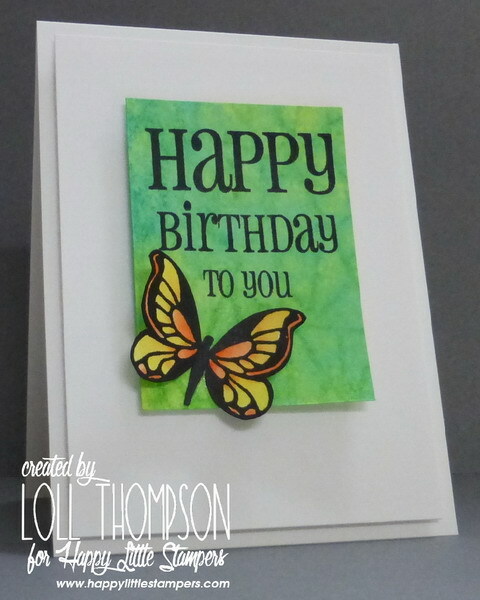 I stamped the birthday sentiments and added a fussy-cut butterfly. I hope I have inspired you today with my cards. The designers and I have had so much fun playing with these stamps! I LOVE the images and sentiments, and the quality of the stamps is awesome! Next you need to hop over to Linda's blog. I hope you can hear me through cyberspace going "Oooh" "aaah" as each card scrolled up. You've managed to make this beautiful butterfly image look so glamorous and different on each card, with the colors, techniques, and expertise of each card. Just breathtaking. And I'm loving that gold glittering on the inlaid candles, and how perfectly the sentiment works with it. The 2 word sets are just so versatile - and look so different if embossed or stamped in various colors. 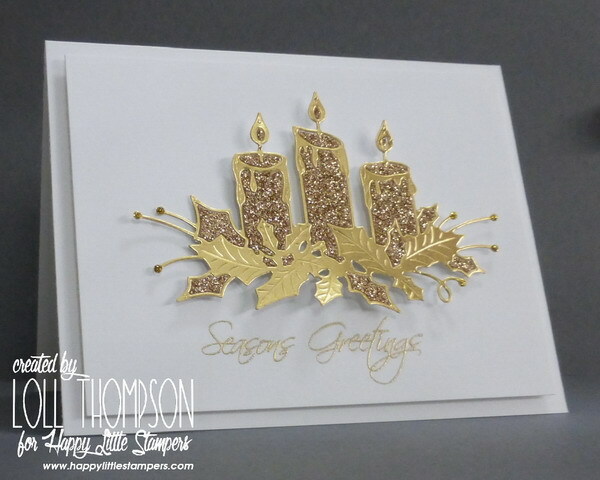 Great use of the stamps, sentiments, and just stunning, awesome show of gorgeous cards! TFS & Big hugs. LOL I have to agree with the other ladies! There were plenty of WOW and Oooh ... Aaah's coming from this side of the screen! AMAZING creations and all are so inspirational! Thanks so much! WOWZA!! Loveliness, Loll! Each card is so beautifully unique. The cards are so beautiful!!! The colorful bells idea is so great! And the balloon card is so pretty! Magnificent Loll! So much inspiration! Loll WOW! It's amazing how many beautiful cards you did! Your creativity and wonderful possibilities offered by the new stamps HLS in effect allow you to create so unusual card. I am very impressed. Love these cards, Loll! The HLS sets are awesome! Loll these are all so gorgeous!! Great inspiration for Kylie's stamps!! Oh, wow! Loving all of the w/c and stenciled backgrounds with these pretty butterflies! 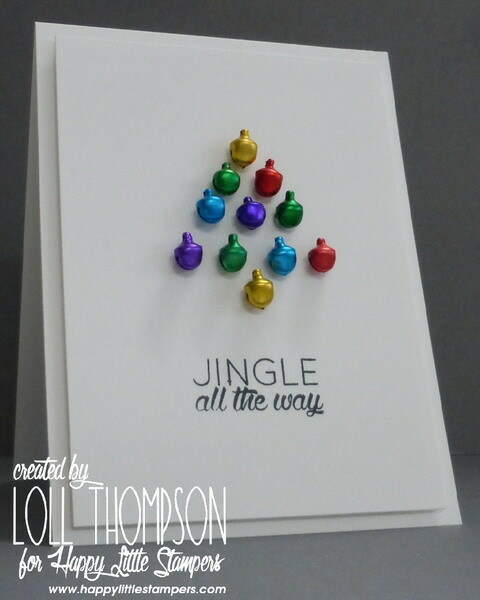 The jingle all the way card is so cute! What an amazing collection of card Loll! I love how different they all are while keeping with your fabulous CAS style. The stamps for the giveaway look very versatile, and the cards--all beautiful-- have a unique flair. Gorgeous, gorgeous cards Loll! I love them all because you have fabulous style! Haha! Truly though, they are stunning, as all your cards are. I love all your butterfly cards! Wowza! Each one of these is gorgeous, Loll! Oh my!! What beautiful cards!! I LOVE every single one of them-especially the ones with the butterflies!! Stunning design! 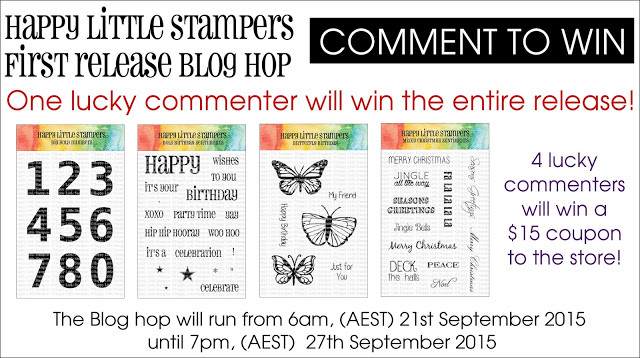 What a fun blog hop party celebrating HLS new stamp sets. I LOVE all the fonts on all your sentiments Loll. TFS mf. Beautiful cards! Wonderful way to showcase the new stamps. Great inspiration - you always do beautiful work! WOW! You were a busy stamper! These are quite fabulous! Amazing creations, Loll! So many way to use the stamps. Thank you for sharing! Love your posts you have great ideas. I can't wait until I get your emails. They are all fabulous - such a great variety of techniques! Wonderful showcasing of the HLS stamps. I especially love the one with the clock stencil and the one with the jingle bells tree! Beautiful cards! I just love these!! I'm a sucker for pretty butterfly cards, but the others here are also beautiful. It would be difficult to choose my favorite. Wow, Loll! You have been busy!! Great collection of cards, the 2nd and 3rd butterfly cards are my favorites, but they are all fabulous! Gorgeous Loll! all cards are fabulous. So many pretty cards. color combos are great. 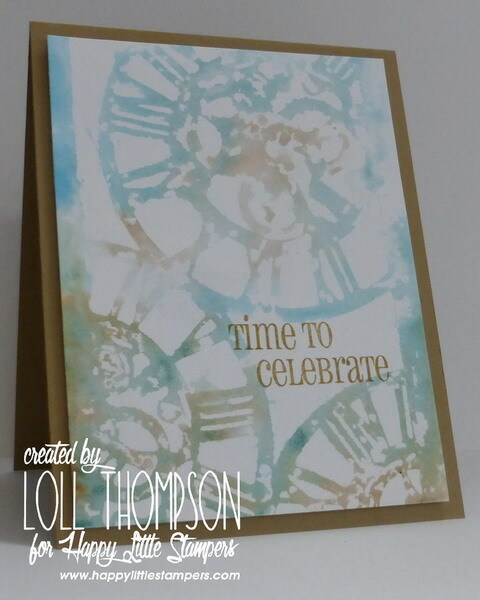 Love the colors on Its time to celebrate card. and can't forget the Christmas cards. Wow you out did yourself. Just lovely. Hugs, Nellie. Beautiful cards Loll and hard to choose one, but I think the gold candles is very, very elegant. What a great set of cards, but I wouldn't expect anything laess from you. Fabulous set of cards, Loll! Love the jingle bell tree! Oh I love your butterflies . Ohh my goodness Loll so much inspiration. Love all of these cards, truly wonderful. Very cute jingle bells. So many inspiring cards, showcasing these wonderful new stamps and various techniques I need to try or revisit. Wow! You've outdone yourself with all these designs, Loll! Thanks for all the beautiful inspiration! They are all gorgeous! The butterflies and the christmas sentiments are beautiful! You certainly have inspired me, Loll! Your cards are absolutely GORGEOUS...Every, single one of them! Thanks so much for inspiring us...I really 'Need' these new stamps! Wow, so much inspiration! Delicate cards, beautiful warm-coloured cards, great backgrounds and a super fun one with the bells! So awesome to see so many beautiful cards! There is no way I could pick a favorite... Have a colourfull week! Nine beautiful Loll cards. Love the backgrounds that show off the HLS butterflies and the techniques on the sentiment cards. What an awesome collection of cards Loll. I love love love the butterfly cards! Oh wow, you ALSO made so many cards! And each of them is so gorgeous! So many amazing cards, Loll! They are all so different and unique in their own way! Gorgeous cards! Love the sentiments (great variety of fonts!) and the lovely butterflies!